Editor’s Note - The ACC has 24 regional sections across Canada, from the Yukon to Newfoundland & Labrador. Regional sections are the strength of the ACC, offering fresh events and activities along with a unique set of characteristics. Have a section story you’d like to share? Send it marketing@alpineclubofcanada.ca and it may appear on the Aspects blog! 2018 has been a year filled with adventure for the ACC:VI's Kids and Youth Program. Winter was filled with three ski trips, one of which was an overnight ski trip that lasted a mere 23 hours due to an un-forecasted 60cm of snowfall over 5 hours. In the spring we transitioned to climbing, but made it on skis by skinning up to South Early Winters Spire in Washington State where we camped for the night. We climbed the spire the following day and skied back to the cars in time to view the setting sun over the spire. Summer comprised some hikes, a hut work party, and a climbing camp, but the highlight was the Dugong Peak Section Camp. In the first Family Week of the Vancouver Island Section camp we got 17 of the 20 kids and parents participating up summits, we climbed seracs, rock climbed on slab, gorgeous cracks, and up a multi-pitch route. The location was magnificent with great access and many lofty goals; it even had a sandy beach. The end of the week was perhaps the sweetest, fuelled by the high from successful summits bids. We truly hit our groove on the last day when we ice climbed in the morning, ate lunch at camp and rock climbed into the evening. We came back safe, friends, and full of appreciation and fond memories. 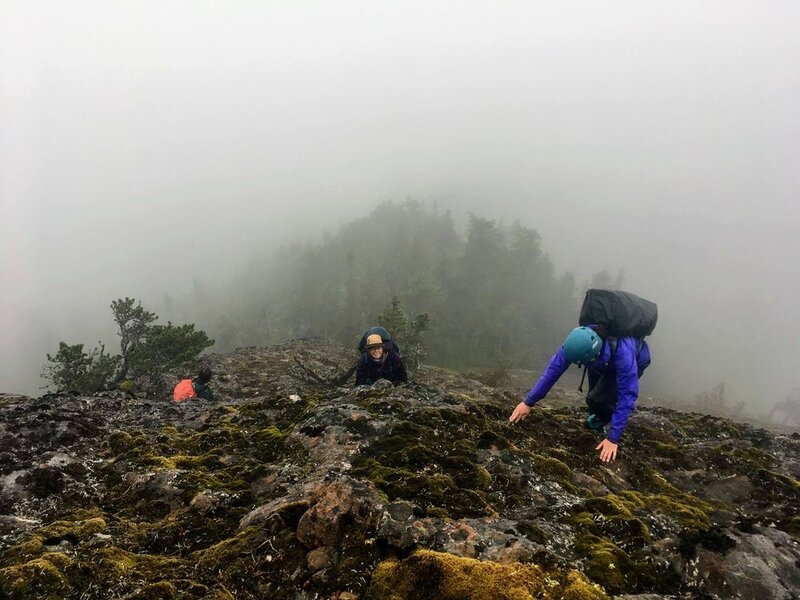 It was a cold and drizzly “Junuary” morning, and the Wild Women of the Vancouver Island Section of the Alpine Club were off to climb the West Ridge of Mount Arrowsmith. The forecast would not deter us from getting out in the mountains. Katie, Krista, Natalia and I (Brianna) met around 8:00am at the trailhead of what us locals call the “Climber’s Trail” for Mount Arrowsmith. Our objective was to climb the 4th class scramble up the West Ridge and descend the rappel route on the North Ridge (or the Nose). I’d done this exact route a couple of times before, both in good and less than ideal weather. Today I knew that we’d be experiencing the latter, but the stoke was high! The cloud was low, hanging just above our head at the trailhead (850m) and the main summit sits at 1817m. The four of us sorted gear, double checked we had everything we needed: rain gear for the way up, warm layers to protect against the forecasted wind for the summit, and harness, helmet, personal rappel gear, rope, crampons and ice axe for the way down. We gained the ridge, started our scramble, progressively getting wetter and wetter as the cloud hung around us. There were some bushy section where the parts of us that weren’t wet before became soaked. I did my best to describe the hidden views; the North-East Cirque below us on the left, often full of snow, and the Beehive looming in-front of us, which has a direct and run out 5.6 variation of the route we were on. Pleasant chit-chat continued throughout, slowing down only when we reached some of the more exposed climbing on the wet and mossy rock. We reached the summit around 12:30pm. After some layers and lunch I lead the group to the top of the North Ridge, and set up the first rappel. The two 20m rappels went smoothly and we scrambled down off the ridge and onto the snowfield at the top of the North-East Cirque. At the top of the bowl we ran into the ACC’s Introduction to Steep Snow, but not before we tried to scare them with bear noises. After much laughing, mostly at our attempted bear noises, many hugs and high fives went around. The four of us gave a special greeting to the only woman in the group, Ashley, whom Krista and I had met on a day hike late last year. We were both stoked to see her out in the mountains. We said our goodbyes, wishing them better weather and headed down the snow and back onto the “Climber’s Trail”. We were back at the car by about 4:00pm, quickly changing into dry clothes and efficiently deciding our dinner stop: Thai food! All in all~ another amazing Wild Women trip. Beauty, friendship - these are ever-present in climbing.” These were some of the perceptive words of Arno Ilgner in his book The Rock Warrior’s Way. Lenka and I co-led an all women, beginner-friendly hike along the Elk River Trail in Strathcona Park on Vancouver Island during the last weekend of July 2018. This was the first time that some of our group of intrepid hikers had camped overnight in the backcountry. Two others, including me, were recovering from recent injuries in the mountains. Together, we enjoyed hiking through the wilderness and the burbling of the river as we swam, ate, and slept. We also enjoyed each other’s company and learned much from each other, including how to prepare and pack for a hiking or climbing adventure. As I emphasized to all the women in our group afterwards, this hike was an important part of my recovery, as I was once again surrounded by the beauty and grandeur of the mountains and by adventuresome and like-minded women. The Trail Rider program has been running for about 12 years when our Section purchased an adaptive mobility device. Its rugged design gives people who cannot walk the opportunity to take part in trips into wilderness environments, including over rough terrain. Our clients have been able to explore parks and summit some of the local hills. The happy spirit of the clients, together with the teamwork and camaraderie of the porters is what makes these trips special. Want to learn more about Section activities?